Эту тему должен изучить каждый родитель!. To everyone bashing canisy and salerno you should stop and realize that it is just as much their right to voice their opinin as it is yours to bash them for doing so. That is what our country is about-partly. However the real issue here isnt the lack of news coverage of soldiers but the mainstream media shifting the focus from a government and country that is falling apart around us to a man (Sheen) who is a media's dream come true. As a soldier myself i can say no one enlists to become a headline on a major media website or the local newspaper from where they grew up. We do our jobs like anyone else and we dont get mad when we aren't recognized. We get mad when the country we're defending is being hurt and torn apart from the inside by the people who we elected to run it. For example our President is now at this moment more worried about making it illeagal to burn a Quron (while burning an American flag is considered freedom of speech) when instead he should be more worried about the lack of money being ppropriated to federal employees. I can't say im defending those two yahoos who decided to take a stab at American troops but I will defend their rights if they are indeed American Citizens. Oh and by the way i have read the Quron and am Lutheran myself. I took an active intrest before I deployed to Iraq in the culture AND language for where i would be submersed in. I became very close with the local populace and learned a lot from their culture. All of this was done while i was trying to be killed by fanatic extremists who were twisting a book of poetry. SO...before you comment about soldiers and their "lack of knowledge" maybe you should talk to a few first. You sound like a pogue! "illeagal" "quron"?? By and large,soldiers are not given much press coverage because they serve without the need to be recognized everyday for it. Sheen gets coverage because he's a human car wreck that has'nt stopped slamming into the guardrails yet. Soldiers should never be compared with this mess. I would be much happier if Congress and the President would simply keep their promises to provide the care of our soldiers were promised after they have given their health and lives to protect us from our enemies. I expect little from the press but they could really help by exposing the dismal resources availible to soldiers and the promises being broken right now to these heros that step in front of bombs and bullets so we don't have too. Never forget the soldiers- especially- when they come home. We should all listen to salerno, he is oh so wise. NOT. Let's talk instead about why we are letting our Armed Services conduct this mission without overt public support. Why and who is sanitizing our press? Jeff Wilfahrt, father of CPL Andrew C. Wilfahrt, KIA, Kandahar, just another war death statistic. Personally I feel the Facebook user is correct. It's disgusting that this egomaniac is getting more coverage than an international war. It shows how banal and pathetic our culture has become. Mr. Wilfahrt, from the bottom of my heart I would like to express my sincere sympathies at the loss of your son. I am grateful that he had the courage to enlist and fight to protect my freedom. May he rest in peace and may your family be comforted by the memories of him you will forever carry in your hearts. I just realized...salerno is a troll. Probably a 12 year old with too much free time. I'm a worthless coward who lives with his mommy. I'm a nutcase right-winger who spouts offf about anything I want to. Caus I'm just that stupid. salerno 28 march i:06 am is not my post. 1. "War is always a crime, so every soldier who voluntarily signs up is a criminal..." To hold so absolute a view allows no room for exceptions. Are you saying then that every single person who picked up a weapon to defend their country during World War II to fight against the Nazis was a criminal? If so, then following your line of thinking, the only acceptable alternative to you would be to take the path of least resistance, NOT fight, and allow the extermination of an entire race of people. If not, then your logic is flawed because you would be saying that "War is always a crime" and "In some cases, war is not a crime." So which is it? 2. If war is a crime and every soldier is a criminal, then how do you rationalize to yourself that almost all religions and countries, at some point, have had to fight to achieve the sovereignty they now enjoy? If you truly believe this, you must be fairly confident that, in your own family tree, no one has every held a weapon in defense of their country. Otherwise, you would be disparaging the very heritage that gave you the opportunity you now have to freely express your views and work in your charity. Freethinker – It is very simple. War is fine when you defend your country INSIDE THE BORDERS. This is the answer to both your questions, in point N. 1 and N.2. I think you missed my point. It is not simple at all because your first absolute statement doesn't really lend itself to any qualification. Basically, "War is ALWAYS a crime" and "War is fine inside your own borders" conflict with each other. To reconcile what you just said, you would either have to admit your first statement was wrong or that you hold conflicting opinions (which means you are arguing two completely opposite points). Freethinker – you are not a good thinker at all. War is ALWAYS a crime because there is ALWAYS somone attacking another copuntry, but the one who defends himself is on the right side. i am an idiot. i make no sense at all. please forgive my stupidity. i am a worthless goat. salerno march 27 – 4.00pm is not my post. I see that nobody could contrast my point with valid thoughts. Salerno – Again with the insults? Really? I have not once criticized you personally despite many of the outrageous claims you have made. I am just pointing out the obvious flaws in your logic. Of course there are always two sides fighting a war which is why it doesn't make sense when you said "War is ALWAYS a crime" in such absolute terms. When you say "the one who defends himself is right" that results in the same problem. Everyone is defending themselves from their own perspective. Yet you would have people believe that every soldier is a criminal. And you still haven't addressed any of the valid points I've raised. I'm assuming that you're taking this way too personally since you are only responding with opinions not facts. Salerno...SO HOW DO WE DEFEND AGAINST EXTREMISTS FLYING PLANES INTO OUR BUILDINGS KILLING THOUSANDS OF AMERICANS? Shall we sit on our thumbs and wait for the next flight? Your genious....that would work well? Bastogne – we wwoild not have had 9/11 if we did not arrest 4 AlQaeda members in Albany helping Mubaraq. This was the beginning of war with AlQaeda. They were not our enemies. These are all unsupported opinions where you have neither explained your reasoning nor what facts you are basing your opinions on. In case you haven’t noticed, #1 and #2 contradict each other. If war is always a crime then, by your own definition, you would be a criminal even if you were defending yourself inside your own borders. For this not to be true, you would have to retract that “war is always a crime” because “always” is absolute and non-negotiable. On #3, the first part and the last part of the sentence also contradict each other. If war is always a crime and all soldiers are criminals, then it doesn’t make sense to say that war is always a crime for some but not for others. Your failure to reason rationally and to communicate objectively does not make me an idiot. It makes you look like an angry nobody who can’t voice an opinion backed up by critical thinking. [Please do add next insult here to reinforce this point]. Freethinker – Your brain is a demostration of the Darwin theory, as you need another thousands years of evolution to undeerstand. My point number 2 is complementary to number 1, not a contradiction, but a specification. Point number 3 makes a distinction betwen those attacking OUTSIDE their borders and thoes who fight INSIDE their borders for SELF DEFENCE. Self defence is an universal principle and does not require any justification. So every comment you are posting is just showing your mental insufficiency. And there it is. Thank you for proving my point that you lack the mental capacity to hold a civilized conversation. You are clearly not only blind to the obvious facts but apparently also blind to the laws of logic. Maybe you should re-read my posts. Or perhaps have someone read them to you very slowly. You can't even see your errors when they are clearly elucidated to you. (Yes, elucidate is a word. Look it up. And while you're at it, you may want to learn how to spell). War cannot always be a crime if you qualify it by saying that it is fine for people in self defense. But it is useless to try to explain that to you. I leave the sober argument to rational people – not you, since you are clearly insane. Freethinker – You do not need to explain a banal word like "elucidate", as it can be difficoult just for your culture level. Your problem is a misuse of the transitive propriety, and the kinds of errors described by R. Bacone like Idola phori, idola theatri, idola specus. More specifically, as a crime require 2 elements, the victim and the perpetrator, so the war can be ALWAYS a crime, but in the mean time ALWAYS a necessity if for self defense inside the borders. salerno, I will not stand to let you have the last word. This article is an attempt to raise the consciousness of the American public to the cost of its warring in personal and financial terms. To turn them away from the trivial and face the fact that we remain a country with undeclared war. This is not a forum for your private views, it is an attempt as an early post put it to remind us collectively that "America is not at war, the Armed Forces are at war, America is at the mall." Ok, you have the last word, I just replied to other posters. Don't even pay attention to salerno; when someone compares the modern US military to that of the entire country of Nazi Germany you know that they are unworthy of your brain/finger movements across keyboard. Salerno – Well history repeats itself so what? That is not the point of the article and yeah you have your freedom of speech and all but once you are in someone else's shoes you will truly understand how sensitive it is especially when you are the one receiving these bodies at your hospital!! Its ok... you are allowed to say whatever you want as it is our choice to join the military whatever the reason may be... BTW I dont think no one cares about history... at least I don't! I love it how instead of talking like normal human beings we treat each other with such disrespect... that is why our society is the way it is right now... Anyway... RIP!!! At least three more American dead in Afghanistan today. To the point of this article why did I have to dig to find that information? Why is this kind of American loss not main streamed. There is blood and guts galore in the TV land of evening serials. Why is the media in this country sanitizing the news of our collective losses. It is two billion dollars of treasure alone every week. That would mend a lot of damaged state budgets. Who is stifling this American pain, to whom does this democracy really belong? Here in the thawing cold north pot holes get more coverage than this undeclared, nation building war. Is this really the country we want? Is this the best we can do for ourselves? OK simple: If you don't want to die a nobody in a war few care about....don't enlist. Charlie Sheen gets more attention be cause....guess what...people care more about him than they do our soldiers. Now I know people SAY they love and support the troops, but actions speak louder than words. If you can't figure yourself out or what to do in life, have too much school debt or live in a dead end town, you enlist in the US welfare program aka ARMY. Fact. remember that that "welfare program" allowed you to have the freedom to right that. Yes you should be thankful just like i am that i am able to freely write. they die so that we may sleep in a bed at night and not hear AKs going off and people screaming 24/7. Thank them and thank God you are not going to suffer and i am not going to suffer for what we wrote. That is one of our rights from the original Bill of Rights upheld by the military. Hey don't shoot the messenger. I'm well aware of the old "a soldier died so you could write what you want" propaganda. The article postulates why Sheen gets more coverage than soldiers and it's because, despite the cute flag stickers on people's cars and military families....people care more about movie stars than welfare recipients. garner – you are brainwashed. Wich US madrass did you know ? really? say that to bin laden and the people that died in the twin towers? i am a useless pig. please do not listen to anything i say. i am a worthless human being. March 27 4:03 is not my post obviously, but the work of an usual jerk. salerno, we fired cruise missiles into Sudan and Afghanistan because of the bombings of our embassies in Tanzania and Kenya. bin laden and all the radical muslims deserve to die. i hope muhammed kills them all. they are all worthless pigs. salerno march 27 4:06 pm is not my post. stupid. So Salerno...it is not ok for the US to fire Cruise missiles at Sudan, but it is ok for BinLaden to kill thousands of Americans? One kills a few and the other thousands. And yet the first is more disturbing? Well I don't think you are thinking clearly. Maybe you should open up your mind and not blindly follow the ones who are feeding you this. I am sure they are keeping you only happy enouph to satisfy your needs while you are doing thier dirty work. Maybe you should take responsibility for yourself and think "truely" independently. Or do you just blindly follow because someone told you so...or they are paying cents for your service. Bastogne – I am not paid like the US soldiers. US did not bomb just Sudan, but also Iraq, Afghanistan (let alone Serbia) during Clinton adm.. So you got what you sowed. Dear Mr. Willfahrt and the Willfahrt family, I am also a person more toward the "right" side of issues, but I am so grateful to you and your son for the sacrifices you have all made for the rest of us. I don't even read or watch CNN any longer but found the link to this article when my brother sent it to me. Your son knew something that is so much wiser than the snotty and disrespectful comments of some who post here would reflect. The reality of our world does not allow for most of it's inhabitants the freedom of expression that so many here do not fully appreciate. Unfortunately, many of those who choose to express their opposition to something like the war (which should be respected by all), do not take into account any basic understanding of what affords them the ability to do that (which is not able to be respected by any). The dust kicked up by the self-aggrandizement of their own opinion must cloud their view of the reality in the world as it actually exists. But they are to be pitied rather than scorned; for it is for the benefit of the foolish such as these, as well as those who appreciate his service, that your son honored us all with his bravery and ultimately with his sacrifice. Don't let the comments of those too lowly in their education or their basic manners, EVER distract you from the lofty appreciation so many of us really have for your son, and for you! Andrew died a hero in the battle of war. But you live on as a hero in life! Thank you!!! And thanks to ALL of the others who give their service and their lives for us. Young men die , the tragedy of war. It has been going on since the beginning of time and unless we awaken to a compassionate view towards all beings this will not change. Families grieve and suffer for the dead. The dead pass on to inhabit other bodies and become fighters again. this cycle of life and death must change. I pray for the families of the fallen and pray that leaders of all nations wake up. There is no advancement of consciousness in this way of life. Sleep in peace Rudolph, Andrew, Chauncy and Brian. Mingle yourselves among the stars with all souls from either side of this warring. We'll deal with the likes of Salerno from here on out. Jeff, Andrew's father. Over and out. Thank you Mr. Wilfhart, and thank you Mr. Wilfhart. Your collective interest in our great nation and the sacrifice you both have laid at Libertys feet matters to me, and to my "strong family of righties". You matter. Thank you. Why are these guys dying again? Thrillathe Killa – Most of what is wrong with this country is SOP for the Grand Old Pedaphiles; lying, cheating, stealing, and then blaming others for their own actions, not to mention their great Family Values of covering up for a House Republican that was an ACTIVE Pedaphile. Yea, it all Hollywood's fault. Blame it on them. You guys produced George W. Bush the WORST PRESIDENT EVER. This clown deserted the RESERVES -Two weeks a year and one weekend a month in the CONUS flying his jet where no one was shooting at him, and he couldn't find the time to complete his service agreement(probably because he was drunk), while real military personnel were in the War Zone not playing but fighting for real, and he has the guts to say he is Vet. BS! The Hammer is going to the Slammer, and Newt Gingrich got kicked out of the House of Representatives for trying to sell government property as his own. You guys are just full of really cool people. Take a dollar out of you wallet and buy yourself a clue. Anthony P Whoa. slow down syndrome boy. What the hell are you talking about. How do we go from Charlie "Tiger Spit" Sheen to all that strange funk that you are spewing!! Aw Man, I hit a nerve with a DEMOCRAP??? S.O.B. I can't believe it. Anthony, come on guy, you can't be this dense. Here, I will help you, Look at the 1st response from Charlie, where he states he is winning MFers and we are all on revision 1.0. Then see the responses from Chuckster, OK now put Charlie Sheen as Charlie and Chuckster as Chuck Lorre!! Do you now get the drift??????? Anthony did you graduate High School ????? In Response to Kory 3-15-2011 @ 5:33pm, Re-read your post, then re-read the last 6 months of news out've afghanistan, Gen Petraeus has had to apologize all over the place for civilian killings. I'd try to emass a number but it would be insulting to the people of afghanistans suffering. Id like to first say that I think the progressivism of gay rights is an important tool in distinguishing the USA from NAZI germany and the like. All three boys made a CHOICE to join the military, and honorable as it may be are they really heroes??? The war in Iraq and Afghanistan has already been compared to the futility and folly of Vietnam. There was no victory in Iraq, we simply left, in Afghanistan our enemies grow RPG'S and AK47'S out've the ground via opium, The USA and its few remaining allies are unwilling to dismantle the multi-billon dollar drug-market the afghans created and in turn will leave afghanistan the same way we left Vietnam and Iraq, as the fleeing-agressors who claim they've won while reeling from economic woe their war created in the first place. So not to sound ike too much of a contrarian but "What makes a hero?" Truly sad ! We care more as a nation about celebrity bad behavior, behavior we wouldn't want to see in our children, but quickly accept in people we consider to be "interesting". 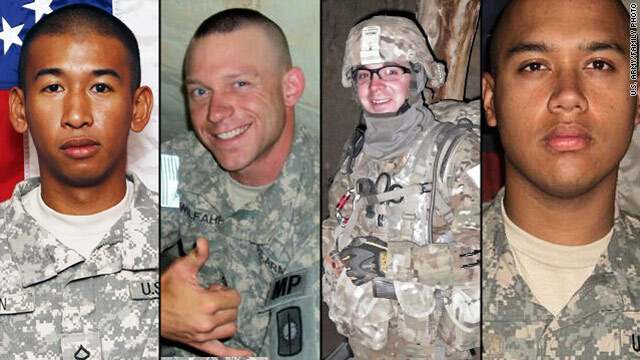 If the media wrote more about these brave Americans we wouldn't have to listen to the minute by minute activities of people we consider "heros" as the taken millions of dollars out of the economy and make fools of us. It is a shame that the true heros don't get to go home, let alone go home with lots of money for contributing more than these media heros would ever even think of giving. We have made them worth the millions and the true heros worth little if anything. I think its a sad day in America when the American people need to be reminded everyday via the media that there are soldiers dying in Afghanistan and Iraq. Posting a reminder on facebook in order to take away the spotlight from Charlie Sheen is not going to save a soldiers life. Yes its a great thing to honor our fallen but there is no resolve to which these fallen soldiers died for. The fighting and killing needs to end and I think the American people need to rally around that cause first and foremost so that no more parents, spouses, children, extended family and friends of our brave have to experience the loss of a loved one again. people are hypocrites. they say they want good news. then when they get it, they whine and ask for more bad news. i'm winning mother f-ckers and your brains are too version 1.0 to process it. You are a Pathetic Drug Addict who is 45 going on 67, and the only thing you will win is the Heath Ledger Award. We just need to know what hotel you will over dose in. The 2 million plus fans you have are MORONS and STUPID like you. CRACK HEAD, shame on Hollywood for putting up with your Pathetic Self, Get help Pin Nuts!!!!!! Chuckster – I believe you are jealous of Charlie Sheen. He is simply an entertainer and he does it quite well; to the tune of making 100's of Millions of dollars for Warner Bros. If you can do as well call Warner Bros and ask to take his place. Remember No Guts No Glory! When Charlie Sheen can't put people in front of the televison then and only then will he "not work in this town again". If you don't want to hear about Charlie Sheen quit clicking on web stories about him The stories are put there based on popularity not importance to the world. If you are dumb enough to keep clicking then you deserve what you get. Regarding the stories or lack thereof about the fallen men and women, the military is also not real interested in you hearing about it every day with details; it tends to erode support for the mission. Anthony P must be a LOSER SHEEN FOLLOWER, must be one of the 2 million MORONS that are his fans. This is a Military Site Anthony and people have a right to their opinion. Here are the facts Anthony, 1. Charlie Sheen is a drug addict, 2. Charlie Sheen is whats wrong with this country and Hollywierd, 3. Charlie Sheen has no real talent, just a following of a bunch of womanizing morons like yourself. 4. Charlie Sheen messed with one of the most powerful producers in Hollywood Chuck Lorre, also known as Chuckster if you get my drift MORON!!!!! 5. Charlie Sheen might have 100 million dollars but the Chuckster has 100s of millions, got it good bye retard!!!! Sheen is DONE!!!!!!! end of line. To the patriotic ones who are reading this thread: please check out "Support Adam M. Malson Elementary" on facebook to learn a story of true heroism and bravery. LT Malson, an Army platoon leader gave up his life saving Iraqi Shia civilians from a burning bus that was attacked by Shia fighters in Baghdad in 2005. Details on his actions and the initiative to have a school named in his honor are on the "info" and "discussion" tab. Your support is much appreciated. To the non-patriotic, negative writers: you have my pity. God will judge you one day. In the mean time, if you reside in our wonderful nation, you may sleep easy tonight, for you rest under the blanket of freedom that I and my brothers help provide. RLTW!! typo: Shia pligrims attacked by SUNNI fighters...aka "sectarian violence"
While you may not agree with the war (I don't), it's pretty heartless to disrespect someone who just died. I honor anyone who lays their life down for this country. I'm looking forward to the day when this is over – one way or another. This can EASILY be one of MY three sons who are coming of age and may not GET a CHOICE. My greatest fear is seeing one or MORE of my children coming home JUST this way. Let's stop the bloodshed on BOTH sides, please. I was going to post a link to this article on Face Book for my friends to read... but after reading some of the posts here, I would never subject them to some of the comments posted here... what is wrong with some of you people!? Callous, heartless, ignorant, misguided idiots.